A pyrometer is a device used to measure temperature and can do so remotely. Pyrometers have the ability to detect very high temperatures owing to the remote sensing capability. They have the ability to detect the thermal radiation emitted by an object. There are two types of pyrometers, namely, optical pyrometers and radiation/infrared pyrometers. Optical pyrometers work on the principle of comparison of the intensity of light that a target radiates at a visible wavelength with the known brightness of an internally calibrated lamp. One limitation of the optical pyrometers is that it detects temperature of only those objects that emit a light or are glowing. When extremely high temperatures need to be measured, pyrometers are the best option since the use of conventional thermometers will result in damage to the measuring instrument. Radiation pyrometers work on the principle of detecting the intensity of the heat radiated from the surface of the object whose temperature is to be measured. Typical application for a radiation pyrometer is in furnaces and boilers. Pyrometers are used in a range of applications, with industrial having the largest share of the market. 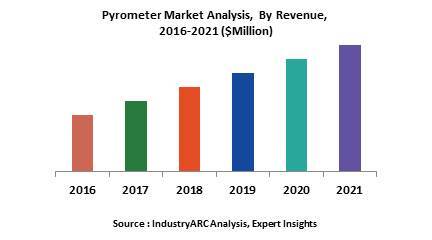 Petrochemical industry is another growing application for the pyrometer market. The non-contact ability of measuring temperature is a major driving factor for the pyrometer market as this leads to ease of use and longer durability. Increasing automation across various industries is another factor that is expected to have a significant impact on this market. While the market is highly fragmented with a number of players in the market, there has been some amount of consolidation as well with several mergers, collaborations and partnerships being formed.